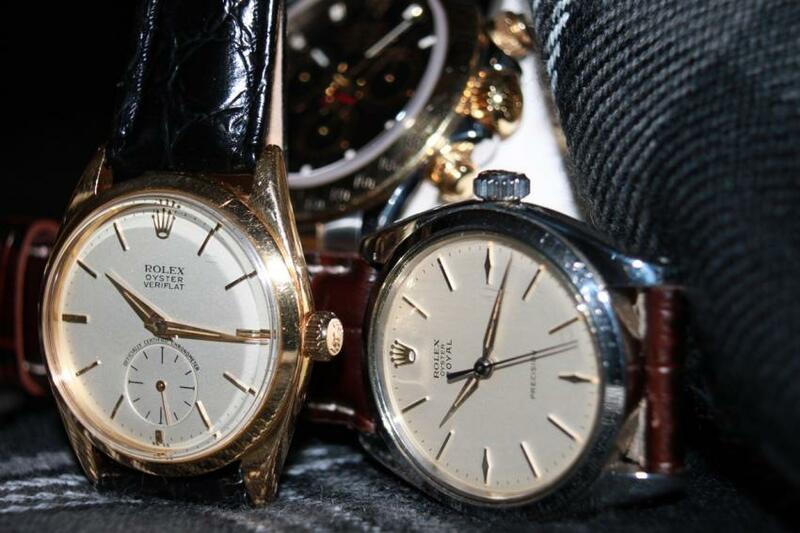 There are numerous factors that come to mind when deciding between a new or vintage timepiece. So let’s narrow this down a bit and assume you are interested in vintage watches. Now if you’re not sure – ask yourself these questions: “Am I a history buff?” “Do I seek to be classic, original or eccentric with my appearance?” “Do I find value in historic things or items of high craftsmanship?” “Do I like to have things that are good conversation starters?” If you’re answering yes to any of these questions then a vintage timepiece may be an item you’ll consider at some point. There are at least three primary considerations when entering the realm of vintage watches. First, there is a collectors market for vintage watches unlike that of a new watch. Vintage watches have a finite inventory due to the fact they are mostly retired by the manufacturer and not available new. That said, sought after vintage watches tend to increase in value over time – sometimes very quickly. Even common vintage watches tend to, at the very least, hold their value after purchase; assuming your purchase price was reasonable. This is quite different when compared to buying a new watch. When you consider the most common leader for resale value, Rolex, takes about a 30% hit after new purchase – vintage watches all of a sudden seem like a great bargain. But, with anything vintage, that’s not the entire story – which leads us to the second consideration. The truth is, it’s not easy to buy a vintage watch in today’s vast marketplace. With so many dealers vying for your business and huge auction houses like ebay; the options and price ranges seem endless. That’s why it’s an important step to decide “am I a collector or am I a consumer?”. I’m going to make this easy on you and help answer this. You are only a collector if you decided this long ago, made efforts to educate yourself and have several vintage watch purchases under your belt – and I don’t mean wearing them under your belt. When it comes to vintage watches – you cannot wake up one day and think of yourself as a collector. Therefore, if, by my definition, you are a consumer, that doesn’t mean you cannot aspire to be a collector. Hell, we all started somewhere. But to my point, and why this is important, it speaks to your risk level and consequently, who you should purchase from. Inexperienced buyers (consumers) should avoid auctions and stick with reputable dealer stores / sites. It’s easier to call and get to know your dealer this way and gain a level of trust. Dealers tend to keep their best pieces for their own retail business instead of paying a heavy auction fee. Furthermore, start with vintage pieces that are on the lower end of your price range to limit your risk as you become more experienced. This is an extra step you need to take when purchasing vintage. For new fine watches, there is an authorized dealer network and you can guarantee you won’t get burned by purchasing from an authorized dealer. With vintage watches, there is no such blanket guarantee. Lastly, you need to acknowledge the fact that vintage watches are sometimes not as accurate and often more delicate than modern watches. Therefore, you cannot expect all vintage watches to perform within the parameters of modern watches. Because most vintage dealers do not offer a warrantee on vintage watches – you need to know a reputable watchmaker for repairs and service intervals. In most cases – one of the first things you should do with a vintage watch purchase is bring it to your watchmaker for inspection to determine authenticity and service requirements. Keep in mind, just because a watch is keeping time well doesn’t mean it should be worn without a service. I’ve come across many vintage pieces hardly worn by their original owner, appearing to work well but never serviced because they sat in a safe deposit box for decades. Watch lubricants dry up in about 5 years and you can do a lot of damage by using an improperly lubricated and dirty watch. A watch that hasn’t been serviced in 50 years, that is ticking along just fine is really a time bomb. Do yourself a favor and heed your watchmaker’s advice on service. The moral of this story is that you should factor in a service overhaul in the price of any vintage watch without a warrantee or without any information from the dealer as to its last service. For watches with time/date or time only, you can expect a good watchmaker to charge about $200-$300 for a complete overhaul. The price goes up for more complicated watches, such as chronographs. This is not something you need to do when purchasing a new watch; although you can expect a service interval in about 5 years, usually at the tune of several hundred dollars. Vintage watches are usually less expensive to service in the long run when compared to their modern counterparts due to the fact they are less complicated on average and use traditional materials – many of which are readily available to watchmakers. Now you’re probably wondering if all of this is worth it. My opinion, absolutely! There is no other fine collectable I know of that is useful, fashionable and can be enjoyed while increasing in value as you use it. As long as you know what to expect, commit to the process, educate yourself as much as possible and take steps to limit your risk in the transaction, this can be an affordable high-end hobby that will be truly enjoyed and rewarding. Adam J Dubilo is the founder and owner of Adam Vintage, a website where you can buy and sell fine vintage watches. Every timepiece in his collection is carefully acquired, researched, examined and overhauled. He’s also an authorized dealer of the famous Hadley-Roma straps, to see his inventory of fine straps click here.